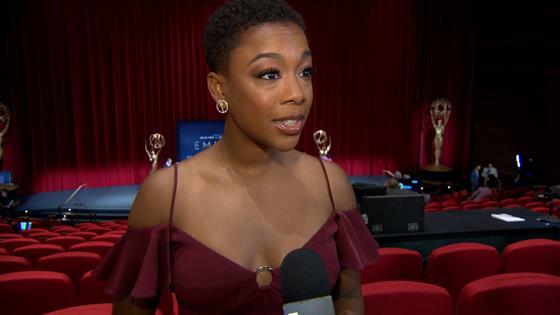 This morning, Samira Wiley announced the Emmy nominations, while at the same time being announced as an Emmy nominee, so you could say things are going pretty well for her today. The Handmaid's Tale star joined Ryan Eggold (The Blacklist and the upcoming New Amsterdam) to read off the nominations, and while she spent most of the day without her phone as she did press, there was one particular text she did get to read. "My wife [Lauren Morelli] texted me. I went to go look at that first. She texted me first," Wiley explained excitedly to E! News in the video above, just after the nomination announcement had ended. "All caps. You know that's really excited when you get all caps." The Handmaid's Tale earned a whopping 20 nominations in the 2018 Emmys, including eight for acting alone. Once again, Elisabeth Moss is up for lead, and while her category is as stacked as ever, Wiley is certainly pulling for her. "I think I'm probably Elisabeth's biggest fan," Wiley said. "Especially in the first season, almost everything I did was with Elisabeth, and I really got firsthand to see how—like a masterclass in how an amazing actor can make you better. So I love Elisabeth so much. She deserves this." Wiley herself is nominated for Outstanding Guest Actress, and she's joined in her category by fellow Handmaid's guest stars Kelly Jenrette and Cherry Jones. Yvonne Strahovski, Alexis Bledel, and Ann Dowd are all nominated for Supporting Actress, and Joseph Fiennes is nominated for Supporting Actor. The show is also nominated for Oustanding Drama Series and casting as well as 10 other categories, so something tells us it won't be walking away empty handed on September 17. The Handmaid's Tale airs on Hulu. Saturday Night Live's Michael Che and Colin Jost will co-host 70th Emmy Awards, airing live on Monday, Sept. 17, at 8 p.m. ET on NBC.